LINK internet panel – online research in the largest and most representative panel in Switzerland. LINK internet panel – high-end online research: LINK online research in Switzerland and Germany sets itself apart with an internet panel that is 100% actively recruited by telephone. In Switzerland 115’000 panelists from all language regions are available for your online research. Since LINK strictly renounces any distorting recruitment methods (e.g. self-registration) and ensures the high-standard maintenance of its internet panel, the LINK internet panel accurately mirrors the population and gives you the surety you are making the right decision. The unique quality of our panel’s sample and the innovative responsive design of our questionnaires are the cornerstone for precise and meaningful results. Do you need fast and cost-effective survey results that you can really rely on? Then the LINK Visual Bus in the largest panel actively recruited by telephone in Switzerland is the perfect solution for you. Every week 1’000 interviews are conducted in the German- and French-speaking regions and, as a further option, another 200 interviews in Ticino in the largest and most representative panel in Switzerland. 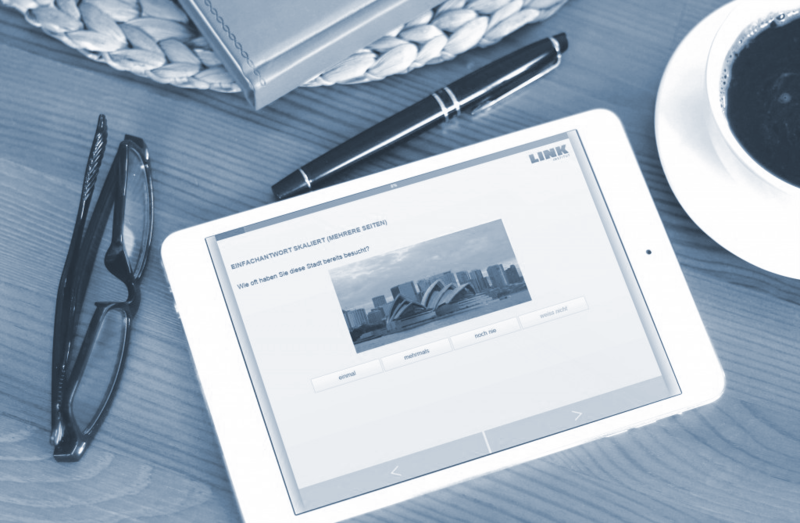 The unique quality of our panel’s sample and the innovative responsive design of our questionnaires guarantee precise and meaningful results. The LINK Visual Bus is ideal for short surveys with visual elements. Ask your target group for their opinion – no matter where they are. Mobile research knows no boundaries. Online surveys with mobile devices enable survey research that is spontaneous, immediate and reflects realistic behaviour and experiences. Immediate impressions and emotions can be surveyed directly at the point of sale or point of event. Perceptions and behaviour are reliably captured without any time delays. Respondents can also emphasise their responses with photos.